I am excited to introduce the first guest post on doctorangel.com, by Veronica Tinney, MPH at the Mid-Atlantic Center for Children’s Health and the Environment. I hope you find this information helpful. There is some background information on the topic along with some tips on reducing your arsenic exposure. Thank you, Veronica, for being the lead on this post and allowing me to review it with you. Arsenic in Food. Arsenic can sound like a frightening thing to be popping up in your child’s apple juice. Should parents be concerned about recent findings of arsenic in food such as rice, chicken and apple juice? Before changing your child’s diet, consider some of the facts about arsenic and how it affects children’s health. What is arsenic? Arsenic occurs naturally in the environment. However, natural does not always mean healthy. There are two types of arsenic found in nature: organic and inorganic. Organic arsenic is generally not harmful to a person’s health, whereas inorganic arsenic is harmful to health. Organic arsenic passes quickly through the body and can be found in foods such as seafood. Inorganic arsenic has been found in apple juice, chicken, rice, and products containing brown rice syrup. Food can become contaminated with arsenic if it is grown in soil containing arsenic. Although arsenic can occur naturally in the soil of some areas, arsenic was once a common chemical in certain types of pesticides. Rice and apples grown on fields where arsenic-containing pesticides were once heavily used can still become contaminated. Arsenic can also be found in groundwater when it is drawn through bedrock containing arsenic. If groundwater containing arsenic is used for irrigation, it can contaminate foods. Similarly, wells that draw upon groundwater containing arsenic can create contaminated drinking water. How does it affect my child’s health? Children may be more at risk for arsenic exposure as their diets tend to be less varied than adults. Inorganic arsenic has similar health effects for children and adults, such as an irritated stomach, skin changes and reduced nerve function. These health effects are unlikely to occur at the low levels seen in juice, rice and other foods in the US. Inorganic arsenic is also associated with certain cancers, heart disease and lung disease. However, most of the data on these health effects comes from populations in India, Bangladesh and Taiwan, who were exposed to heavily contaminated drinking water over many years. For example, US drinking water contains an average of 2 parts per billion, whereas drinking water in Bangladesh has been found to contain upward of 200 parts per billion. Although there is no level of inorganic arsenic that is considered safe, the effects of the low levels ones found in recent reports are still unclear. What is clear is the less inorganic arsenic in food, the better. Are there any foods that I should avoid? It is important for children to eat a well-balanced diet, rich in fresh fruits and vegetables, dairy products and whole grains. There is absolutely no need for children to consume juices. Children between 6 and 12 months should consume fruit instead of juice and children 1-6 years of age should receive at most, 4-6 ounces per day. (In fact, Dr. Angel usually recommends against juice for all ages, from infants to adults! She often refers to it as “diabetes in a cup.” This recommendation is unrelated to any concern about arsenic and rather relates to juice being high in sugar http://www.healthychildren.org/English/healthy-living/nutrition/pages/Where-We-Stand-Fruit-Juice.aspx). The results of a recent study also found arsenic in consumer chicken products. However, inorganic arsenic was found in low levels, thus unlikely to cause health problems. Arsenic can find its way into chicken meat through poultry drinking contaminated water or through arsenic-based drugs fed to chickens to reduce parasites and improve pigmentation. The most common arsenic-based drug for poultry was voluntarily removed by its manufacturer in 2011. In January 2013, Maryland became the first state to ban arsenic from chicken feed. Rinse rice before cooking. You can also cook rice in excess water and then drain off that water. Both these actions may significantly reduce arsenic content in your rice, as discussed in a Chicago Tribune article. Take a look at the inorganic arsenic level for foods that you buy in the 2012 Consumer Reports findings or the FDA’s reports. Aromatic rices, like Basmati or Jasmine, tend to have lower inorganic arsenic levels relative to non-aromatic rice varieties. Though brown rice tends to have higher levels or inorganic arsenic, Dr. Angel would caution against completely avoiding this more nutritious, whole grain, until more information is available. Rather, choose the aromatic whole grain options, rinse thoroughly, cook in excessive water, and drain. You may also want to try to choose imported or California grown rice varieties, which seem to have lower arsenic levels. Do not give rice milk to infants under 12 months and limit rice milk for children who are under the age of five. 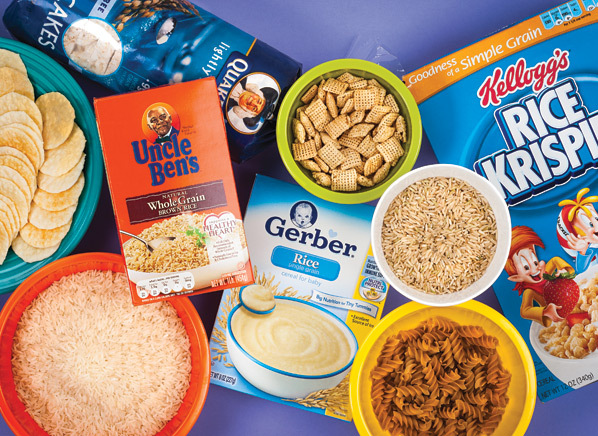 Limit rice cereal in infants—remember that processed cereals are not a necessary part of an infant’s diet. More info here. Look on packaging for foods that contain “brown rice syrup” and limit your intake of these foods. If rice is a mainstay of your diet, you can try other nutritious grains like quinoa and amaranth to reduce rice consumption and increase variety. This is especially important for kids with multiple food allergies. In fact, Dr. Angel would recommend that you see a nutritionist if food restrictions force you to rely heavily on rice products. If you have a private well, make sure to have your water tested to ensure that it is below establish limits. If you find that your well does have levels of arsenic, consult your state or local health department to see if they have any resources for remediating arsenic. Work with a water treatment specialist to determine the best way to remove the arsenic. “Point of use” systems exist to remove arsenic in water sources in your house that are commonly consumed as drinking water, such as the kitchen sink, refrigerator and ice maker. Information on certified water treatment products is available from the National Sanitation Foundation (NSF). If you have a public water supply, you can contact your provider to find out if there is arsenic in your water. Do not smoke, and encourage anyone in your family who smokes to stop smoking. Arsenic is present in cigarette smoke among many other chemicals that are harmful to your child’s health. Some pesticides can contain arsenic, and in general it is better to avoid the use of pesticides, especially in homes with small children. Try using less toxic methods first, such as repairing holes and cracks, reducing moisture, and using mouse traps. Is anything being done to regulate arsenic in my child’s food? The US Environmental Protection regulates inorganic arsenic in drinking water, with the maximum permissible level set at 10 parts per billion. The Food and Drug Administration (FDA) does not currently regulate levels of inorganic arsenic in food. However, it has proposed the same limits on water for apple juice, though the rule has not yet been finalized. The FDA also just released its report on arsenic and apple juice, noting that apple juice is safe for children and adults. In 2011, the FDA increased its testing of apple juice, due somewhat in part to parental concern over the airing of arsenic in apple juice on “Dr. Oz” and the 2012 Consumer Report findings. It is important to note that the study featured on “Dr. Oz” did not differentiate between organic and inorganic arsenic, and therefore the results do not accurately portray the risks to children. Where can I get answers to questions about my child’s health and the environment?Pediatric Environmental Health Specialty Units receive questions such as these and many others related to the environment, and can provide credible and science-based answers to anyone with a question on issues related to health and the environment. The PEHSUs have developed a factsheet with information on arsenic with further information. If you are outside the Mid-Atlantic region, find the PEHSU in your area by visiting www.pehsu.net or calling 888-347-2632.